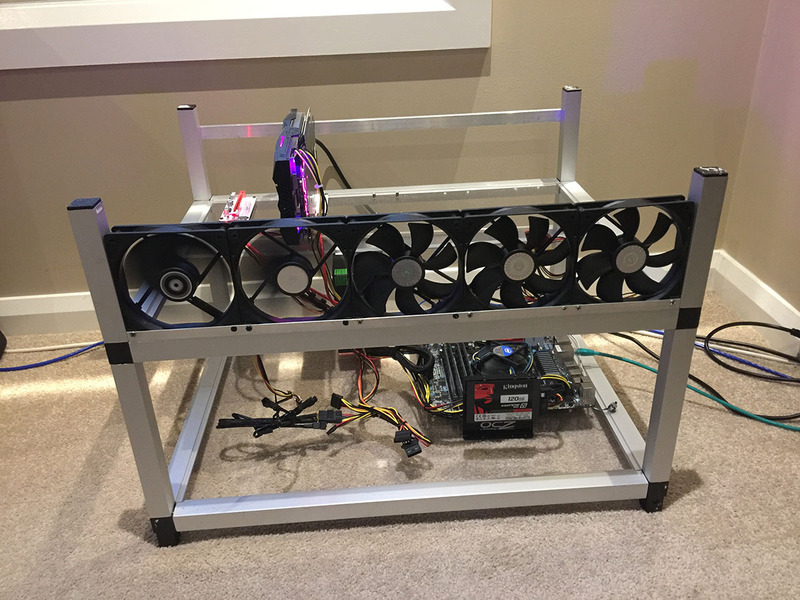 I've always had fun building desktop PC's, and for the past while Small Form Factor builds have been my focus, but recently I thought I'd try building a Crypto Mining Rig. This type of build for me is much more of a construction job like making something for the house, or some type of hobby project than building a PC. I used a bunch of tools like my Ryobi Compound Saw, Set Square, File and even dusted off my Tap and Die set. 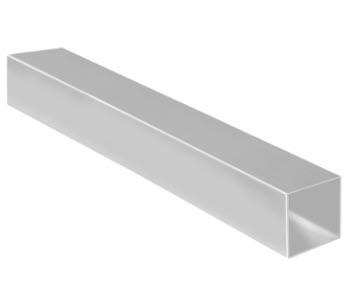 Sourcing some aluminium cross bars here are quite expensive, but I managed to find everything I needed at my local hardware store. 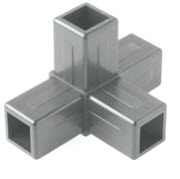 They are selling a brand of Connectable Aluminum Tubes called Connect It. 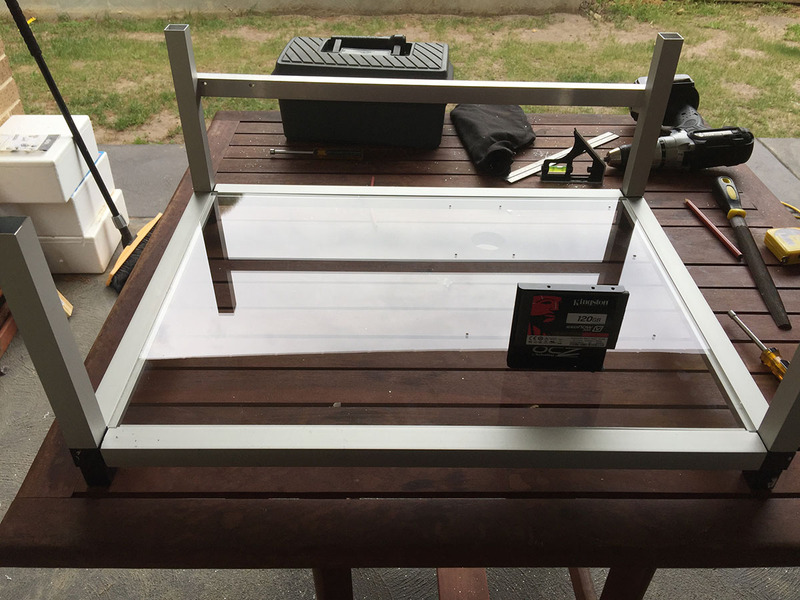 I liked the look of this as my main construction material as it was easy to connect together and the tubes are about the right size, light and thin enough to easily cut. One thing to think about here is that there are 2 types of tubing, one with a lip on it and one without. I used the one with the lip for the flat part of the base and the second level. Another common material I've seen people use is a timber or ply base. Personally, I just hate plugging electronics that potentially get hot into timber. I'm sure the people who use it won't have any problems, but I wanted something a little different. 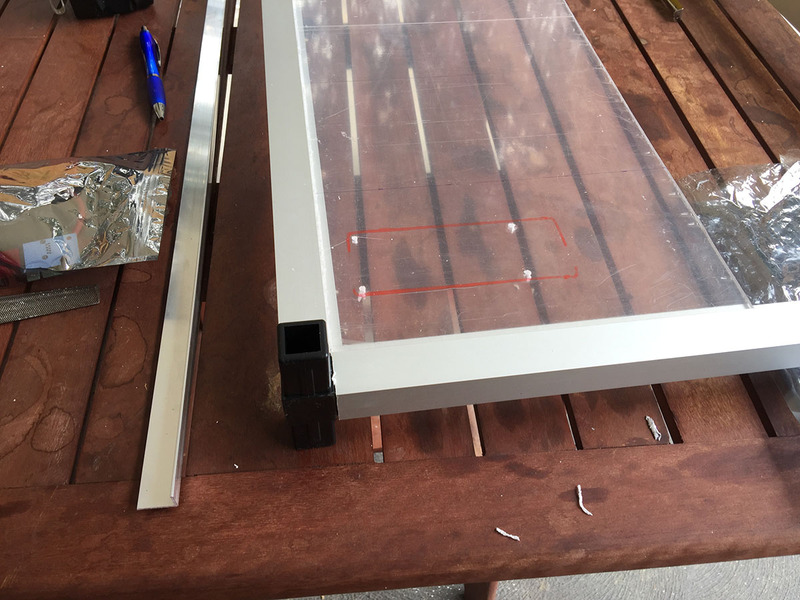 I'd seen some other builds using Acrylic sheets, so that's what I decided on. 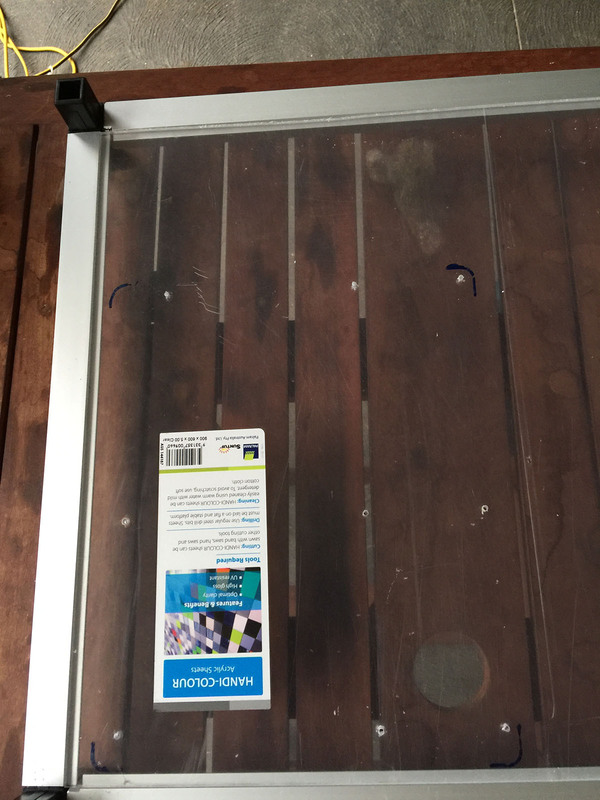 I grabbed a 600mm x 900mm acrylic sheet from the shop. The nice thing about these sheets is they come with a protective wrapper on both sides. So leave that on until the very end, and when you take the wrapper off you have a beautiful clear sheet. To figure out my dimensions, I looked at the lengths that the Connect It tubes came in, then worked out what I feel was the best size with the least amount of cuts. They have 600mm lengths, and since I wanted to include a 120mm fan for each GPU, I could fit 5 GPU's perfectly within the 600mm. This also worked out well as the Acrylic sheet also was 600mm, so I only had to make one cut. With the depth, I needed to make sure I could support even the longest graphics cards, plus some additional space to mount a SSD. I ended up going for a depth of 440mm. I could have probably easily got away with around 400mm. The Connect It joiners have a useful 4 prong connector which was perfect as it performed 2 functions, firstly feet to keep it off the ground, and secondly a way to stack, meeting one of my primary build requirements. Nothing too complex here, I just the tubes with my compound saw. 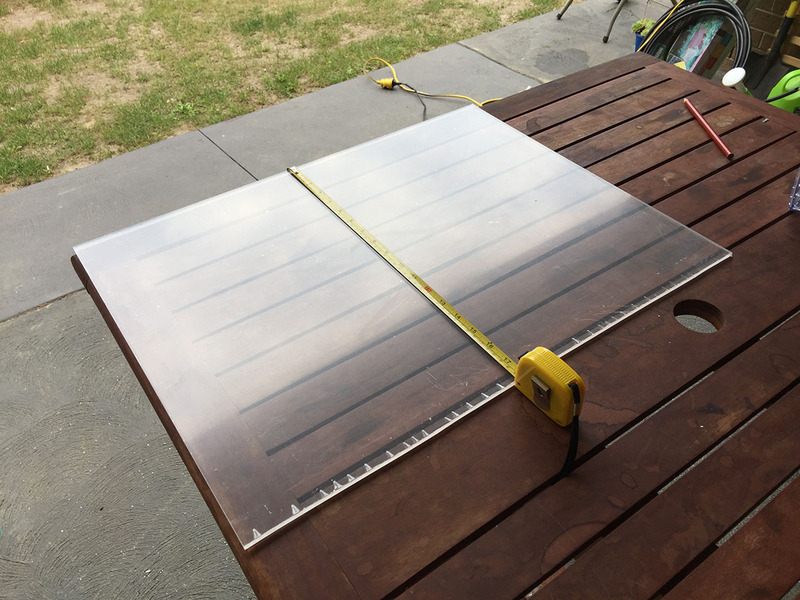 Since its a light aluminum a multi purpose blade that cuts timber should be ok with this as well. I used the bar with the lip, and had to shave a small amount of the lip off the edge of the longer bar to allow them to fit in all the way. 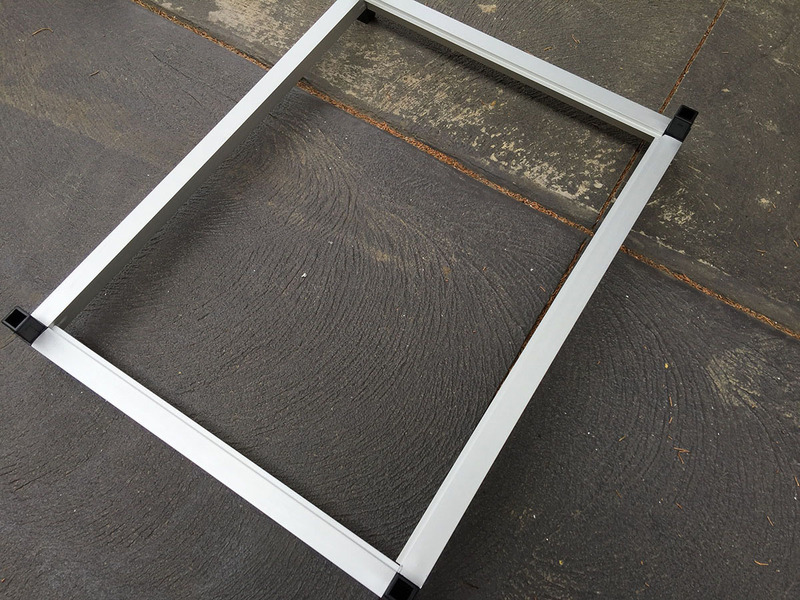 I measured out the length I needed the acrylic sheet to be based off the inner dimensions of the frame. I then cut it with a JigSaw. I used a Clean Straight JigSaw blade. This cut the sheet beautifully, although you have to focus pretty hard to make sure you don't go wonky. I drew a straight line to follow on the top of the sheets plastic wrapper. After that I placed it in the frame and dropped my motherboard on top for finding the screw placement. I faced the board out to the side to make it easy to plug in network, keyboard, mouse etc. I'm using a Gigabyte Ultra-durable board with an i7-2600. 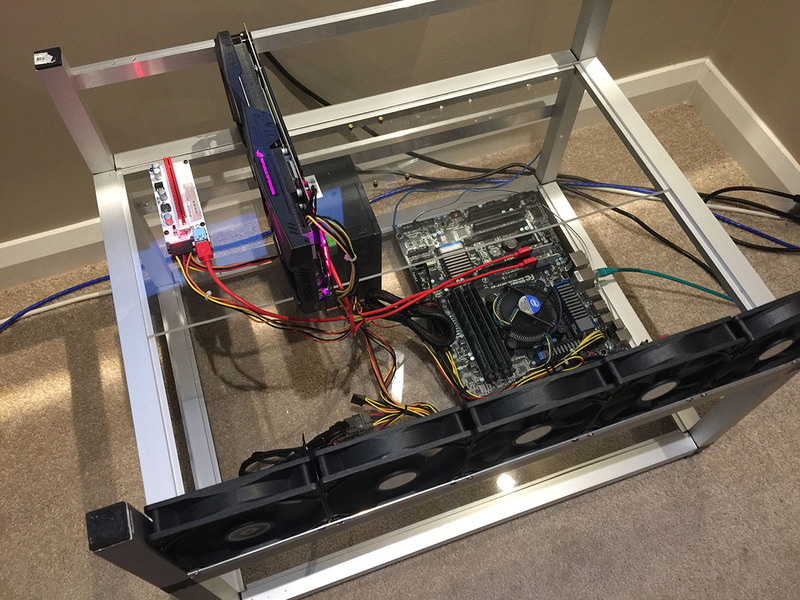 It's an 1151 socket and performs really well, easily good enough to a mining machine. It also can support up to 5 GPU's. Marking the ATX holes was a bit difficult as I couldn't get a pen through the holes, so I opted to make a small stamp by coating the end of a small metal pole with a whiteboard marker and pushed it through. I drilled out the holes with a 3mm drill bit (at least I think its a 3, it was the perfect size though). One thing I'll point out here, is that it's safer to use a Tap and Die set to cut the thread in the Acrylic. Initially I just screwed a stand-off straight in, however one broke which I then had to drill out. So my advice is to cut the thread properly and don't be lazy using a stand-off. This level was for the GPU's. I cut 4 tubes (no lip) at 230mm and placed them on the bottom section. I also decided to screw in a 2.5" SSD mounting plate to the base. 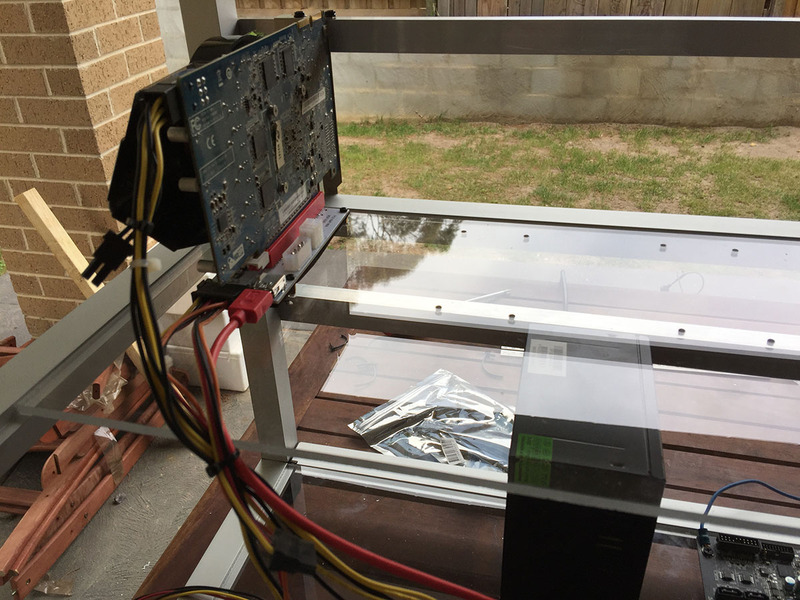 You might notice that I also but in a piece of right angle aluminium so that I can secure the Power Supply. Originally I put the Power Supply on the end, but decided to move it closer to the center later to make it easier to get the cables to the cards. 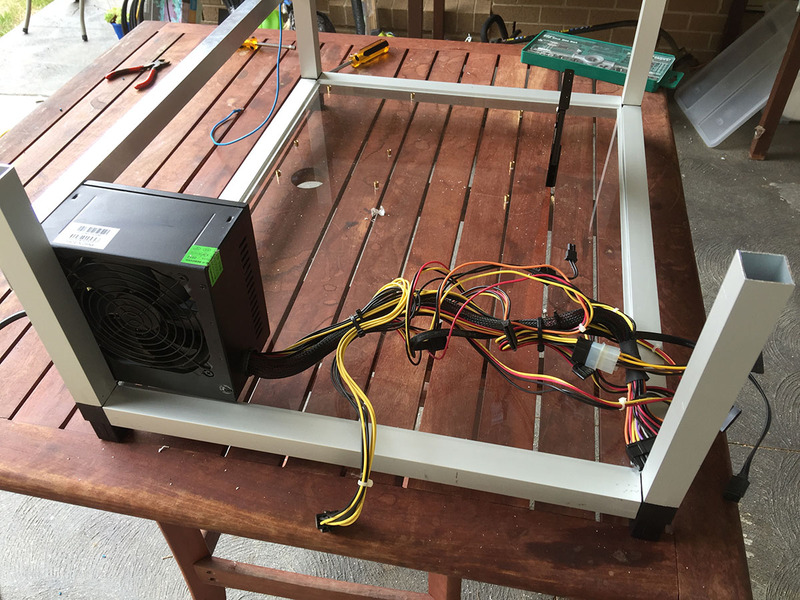 In actual fact this isn't a good mining Power Supply, it doesn't have nearly enough power or connectors. But it will do for now. Next I created the second level frame, which really is just a copy of the base, except that I used the No Lip bar on the front. The second level shelf needs a depth of at least 15cm, but I took mine to 23cm as it was exactly half of the remaining sheet left. So this gave me enough material for 10 GPU's if I wanted it. 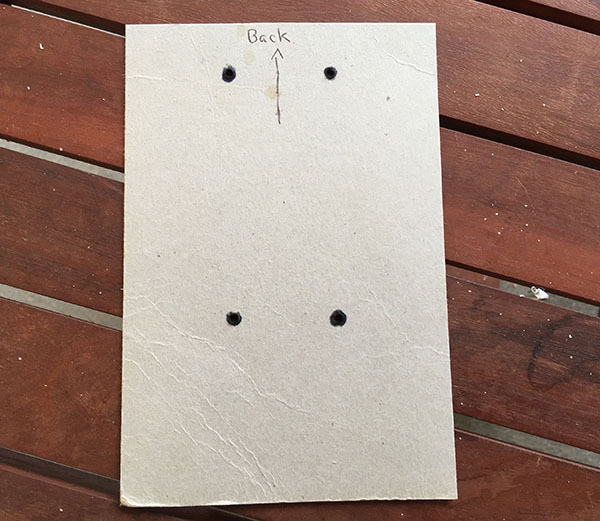 After figuring out the first placement of screws for the GPU risers, I put together a stencil out of cardboard. I also made sure the width of each cell was 120mm. I drilled out all the holes, cut the threads and tried it out with an HD 5770 I had floating around. Here's the Riser in place, and and a back bar to screw the cards into. This was more of the right angle aluminum. BTW, I'm using a Powered Riser (version 8). I think they are up to version 9 now. 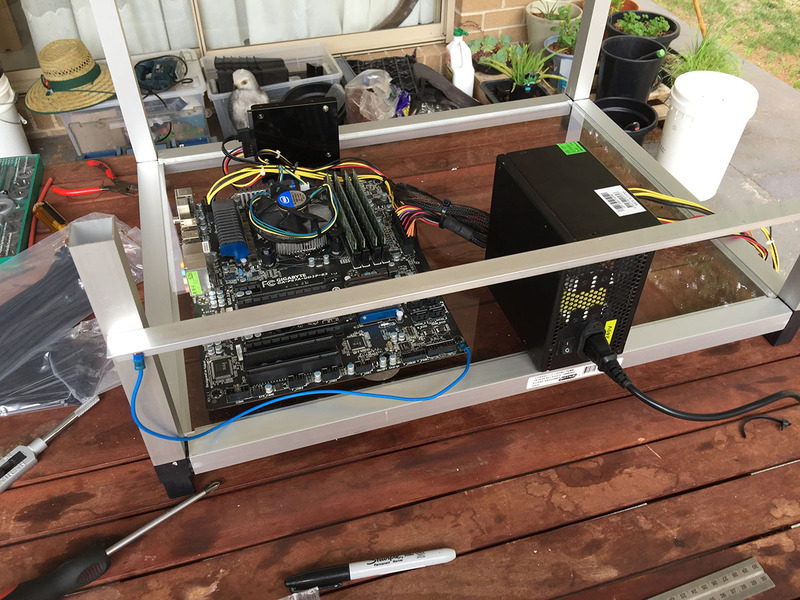 Make sure you only use powered risers, these are more stable and avoids the cards taking juice from the motherboard, which is especially important when you add in a bunch of cards. 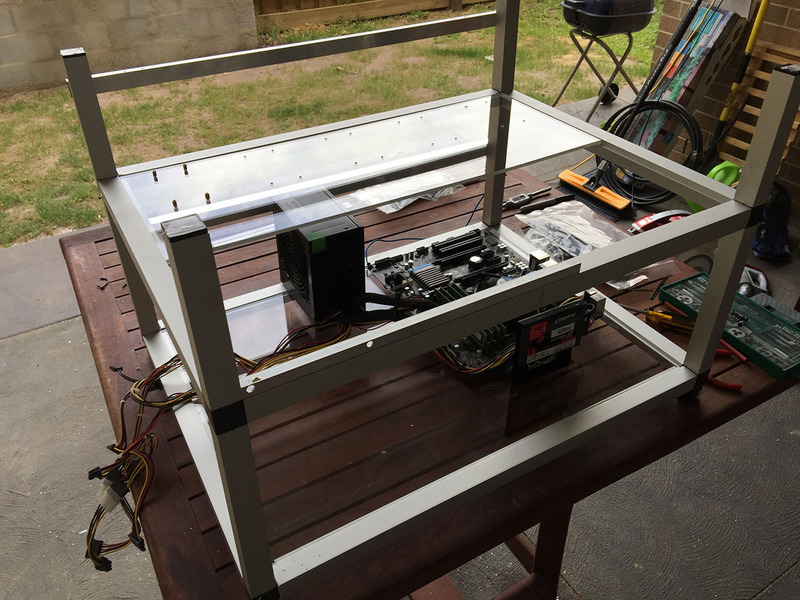 After putting on the Riser and back bar I put in another length of right angle to mount the 120mm fans. Unfortunately, I had run out so I had to head back to the shop for more. I replaced it later. One thing to note here is that when you mount that piece to the frame, you really need to counter sink the holes and use a tapered screw otherwise the fans sit on top of the screw and don't sit flat. 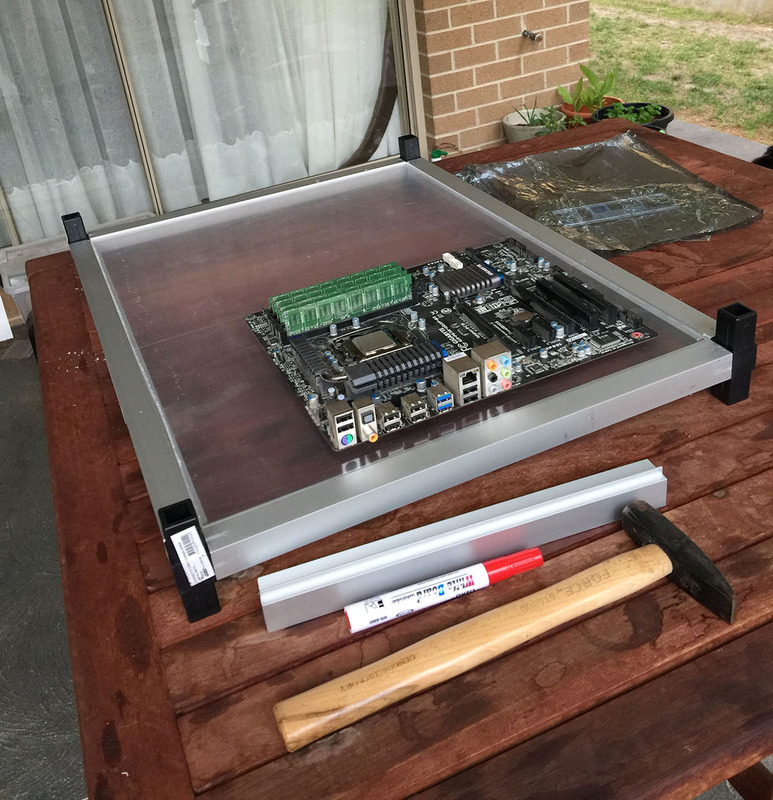 Back in the old days, when motherboards used to sit inside metal cases (and not sit on acrylic in an open frame like today), motherboards would always be able to find an earth. I don't even know if its needed anymore, but I figured it couldn't hurt to give it one. So I made up a cable and attached it to the frame. I had a look under the board, and one of the mounting holes did seem to have some connection in the PCB, so I put the earth there. If anyone has anymore ideas on if this is needed these days, feel free to laugh at me in the comments while you explain the realities :). Firstly, and this is the funny part, decent mining GPU's are so darn hard to get hold of these days, that I have only 1 card I can use. But, I'm aiming to add to it over time. Oh and when I say funny I mean the opposite. Hey AMD, why don't you flood the market with decent GPU's designed for mining and power efficiency. That might keep the gamers happy as well. I added a small power switch from an old PC case (who uses those anymore, they are sooo 2015). I also got a molex to 4 pin adapter to power the 120's. 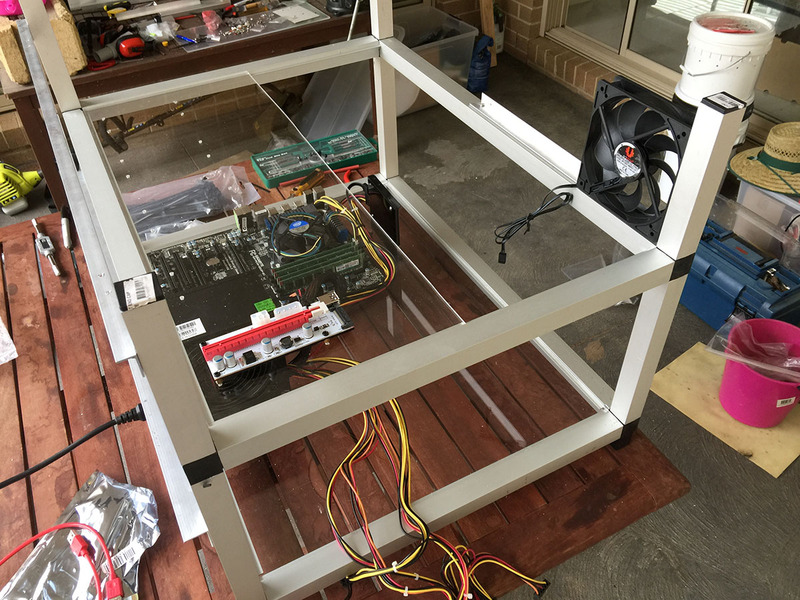 Building a mining frame is easier than finding mining GPU's. Good materials for this are available from your local hardware shop and its a lot cheaper than buying a prefab'd rig. BUT... It's time consuming, and fiddly. Getting the screw holes in the right place isn't always easy. Also, you need some decent tools, and if you don't have them it's not really worth buying them just for this, just go buy a rig from eBay. However, this is now a pretty good blueprint if I want to build another. Also if I want more than 5 GPU's, I'll build another level and put it underneath, with a small cut out next to the motherboard to allow the cables to go through. Right, now I need to buy some GPU's. Does any one have a RX Vega 64? LOL! Oh, you have one that you want to sell me for 2 or 3 times the price. Thanks but no thanks. I'll just carry on with my 27 mega hashes until AMD get their act together.